World War I changed Karl Barth's theology forever. In this book William Klempa presents for the first time in English thirteen sermons that offer Barth's unique view and commentary on the Great War. Barth saw the war as "a unique time of God," believing it to represent God's judgment on militarism. The sermons reveal a deep strain of theological wrestling with the war's meaning, as Barth comes to see the conflict as the logical outcome of all human attempts to create God in our own image. As it demonstrates a decisive shift in Barth's early theology, this volume is essential for anyone who wishes to understand the twentieth century's greatest theologian. 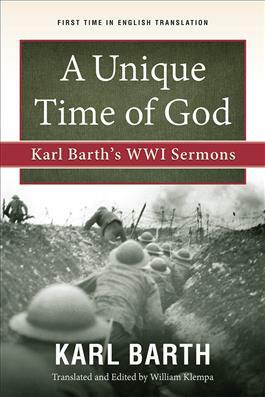 "In his illuminating introduction to his fine translation of Barth's World War I sermons, William Klempa demonstrates in A Unique Time of God how these sermons are the true beginning of Barth's later theology: through them a revolutionary theology was born out of the necessity and struggle of proclaiming the Christian message during the first few months of the Great War. In these sermons, the pastoral and theological strengths of the young Barth are already present. Also evident are the liberal emphases of nineteenth-century theology and the beginning of Barth's negation of them. Klempa's work sets in high relief a major milestone in twentieth-century theology." "William Klempa's translation of Karl Barth's Safenwil sermons at the outbreak of World War I, accompanied by a very fine introduction that sets the historical and theological context, represents the culmination of a careful, critically appreciative, and lifelong engagement by Klempa with Barth's theology. All readers of Barth are indebted to Klempa, a seasoned interpreter of Barth, for making a new English translation of this important part of the Barth corpus available."